Love has a history — and yet the precise contours of that history shift according to whose experiences and which sources we foreground.1 The complexities of love and romance across the central years of the twentieth century are amply demonstrated in the pages of this edited collection. 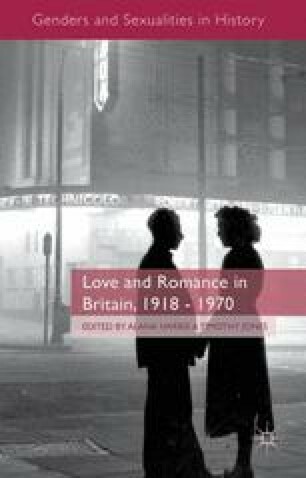 From the diverse emotional attachments of working-class northern men, through the sometimes bittersweet life writings of interwar women, to the oral histories of lone mothers and romantic feelings in retirement, the dynamic nature of love across individual lives and life-cycle stages is expertly illuminated. So too are the ways in which individuals work within, and actively engage with, broader cultural discourses of love and romance in order to fashion emotional selves. As Stephen Brooke so perceptively shows, people in the past were more than capable of inhabiting both the dream worlds of film and music and the real world of lived experience. Whilst a range of self-appointed experts strove to define the parameters of everyday emotion and romantic taste, ordinary people proved remarkably resistant to their dictates. If outright opposition to newly established norms was rare, under-the-radar subversion was rife.